Posted on May 13th, 2016 by Jacob. 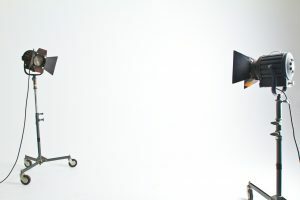 While filming interviews may appear to be a simple job, if you’re looking to get the best quality from the footage, your lighting will have a big impact. “Keylight”. If this term is new to you, it simply refers to the main light on your subject. Keylights are typically the brightest light on your subject and normally come somewhere from the position of the camera. Your keylight is going to affect the overall mood of your subject’s face more than any other light you place in your scene, so experiment and make sure you are happy with the shadows it either casts or the shadowlessÂ light it creates. Once you have your “keylight” set up, now you need to give your video a little more depth: The best way to do this is by adding some backlighting to help edge your subject out of the background and make them appear more three dimensional. Every single image you see in print or in any marketing material has been photoshopped and tweaked to have a stylized look. Unfortunately, with video, we cannot easily “photoshop” out any imperfections like we can on an image. However, that doesn’t mean we can’t use a little colour grading and contrast adjustments to give our image a little more interest. Most home editing systems have a colour grade setting (similar to Instagram) which can give your image a mood. If something is too dark, it can’t be saved, but you can add into a well-lit shot.